Rowdy Brass Band | Colorado Mesa Univ. The Rowdy Brass Band is an elite CMU “ambassador” ensemble designed to train a 21st Century musician and meet the demand for high quality entertainment both on and off campus. This 15-18 member ensemble performs custom arrangements in pop, rock, jazz, latin, ceremonial, and other styles of music. The band is all-acoustic, performs all music by memory, and is mobile - they can perform anywhere! 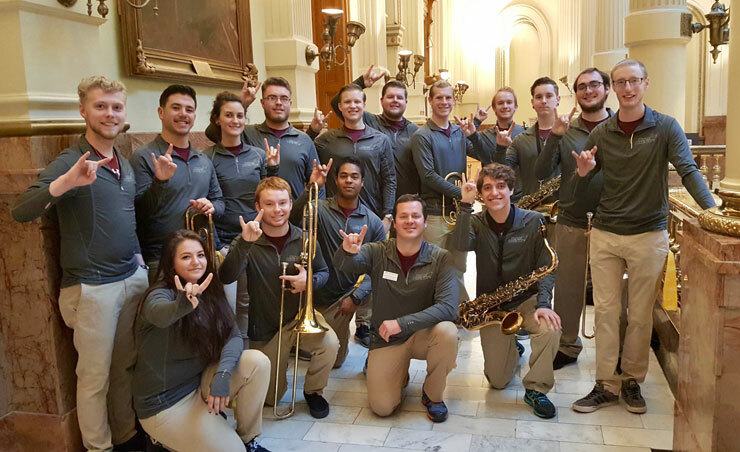 The Rowdy Brass Band consists of CMU’s best (auditioned) brass, saxophone, and percussion student musicians who get real-world professional experience, including a large annual scholarship. They rehearse weekly during the fall & spring semesters, preparing for performances from August through May. Dr. Hinkle leads, arranges music for, and also performs with the Rowdy Brass Band. $1500-$2000 scholarship for each member - RBB scholarships can be combined (are ‘stackable’) with music major/minor (applied studio) scholarships, and amount is dependent on membership experience/level and instrument needs. RBB scholarships replaces other athletic band awards if applicable, and increases with subsequent years of participation and positive membership. Contact Dr. Hinkle for more details. elite one-on-a-part chamber ensemble modeled after groups like Disney’s “All-American Band"
Instrumentation: Saxophones (alto, tenor, bari), Trumpets, Mellophones, Low Brass (trombone, baritone, sousaphone), Percussion. Alternates for each instrument may also be chosen. Exact instrumentation, including the possible inclusion of electronic instruments in 2019 (guitar, bass guitar, keyboard, etc. ), are dependent on audition and personnel (new CMU students and non-music majors are encouraged to apply). performance venues: campus events, downtown businesses, special requests, recruitment visits, sporting events, special paid travel, etc. UPDATE! - 2019-2020 RBB auditions will be held on Monday, April 15 and Wednesday, April 17, from 2-3pm in the CMU Band Room (MPAC 005/006). Auditions will be first come, first served. Incoming CMU students are encouraged to perform their RBB audition excerpts as part of their music major/minor/ensemble placement audition (Priority Scholarship Audition day is Friday, Feb.15, other dates scheduled directly with appropriate applied professor). In lieu of both of these possibilities, students may also choose to submit a simple video (via YouTube link) directly to Dr. Hinkle (jhinkle@coloradomesa.edu) by or before 5pm April 15. Video production and quality does not need to be high level, however, any demonstration of music being played by memory must be obvious to the viewer (ie. perform towards a viewable wall or other). Current members are not guaranteed a future spot. All potential members must audition. Current members must play assigned parts of audition music (below) by memory. Potential future members should choose a part that best fits their ability level and desired part placement. Playing by memory is encouraged for potential future members, but not required. Instrumentation in the RBB is not set from past ensembles (i.e. trumpets, saxophones, mellophones, trombones/baritones, sousaphone, percussion), but rather will be dependent on the high musical standards and commitment of auditionees each year, including the use of new instruments in the future (i.e. bass guitar, guitar, keyboard, drum set, electric instruments, etc.). Do you want to consider beeing in the RBB, but play a different instrument? Come talk with Dr. Hinkle and/or audition before it's too late. “Round One” - Play all of desired (most appropriate) part adjusting octaves/range as needed. Search “Youngblood Brass Band Round One” on YouTube.com for appropriate performance tempo and style. Optional - Demonstration of your unique musical abilities (i.e., improvisation, range, contemporary performance style, extended technique, music arranging skills, etc. ).